This book, the first to explore religious education and post-modernity in depth, sets out to provide a much needed examination of the problems and possibilities post-modernity raises for religious education. At once a general introduction to this topic and a distinctive contribution to the debate in its own right, Religion, Education and Post-modernity explores and illuminates the problems, and possibilities opened up for religious education by postmodern thought and culture. 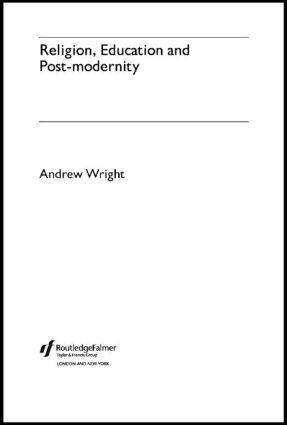 The book describes the emergence of post-modernity, considers the impact of post-modernity on religion, addresses its impact on the philosophy of religion and considers the nature of religious education in the post-modern world. Andrew Wright argues that, although post-modernity has much to offer the religious educator, there are also many pitfalls and dangers to be avoided. Steering clear of the extreme of post-modern hyper-realism, he constructs a religious pedagogy sensitive to post-modern concerns for alterity, difference and the voice of the Other, whilst insisting on the importance of reasons in cultivating religious literacy.